One of the most exciting aspects of our recent trip to Disney World was the fact that we would be staying at The Contemporary Resort. Though it was never at the top of our "resort wish list," we did always fancy the idea of staying there at least once. Since Adam had the opportunity to attend a conference at this delux resort, we thought "why the hell not." Let me start off by saying, we did not enjoy staying at this hotel. That is not to imply that it doesn't have its charms, but for the sake of this blog post we are going to start with the bad. I realize that this is one of the few original resort hotels at WDW, and that many people have many sentimental feelings toward it. (much like our sentimentality toward Animal Kingdom Lodge) But I think it is undeniable that the theme is weak at best. For a resort that is supposed to be contemporary, it is rather muddled. Brushed steel, glass tiles, wood paneling, geometric shapes...the only thing this says to me is "Ikea Contemporary." One corner of the elevator has FIVE different materials. The guest rooms, though EXTREMELY large suffer the same fate...mirrored walls, fabric headboards, random glass vases, awkward desk etc etc... 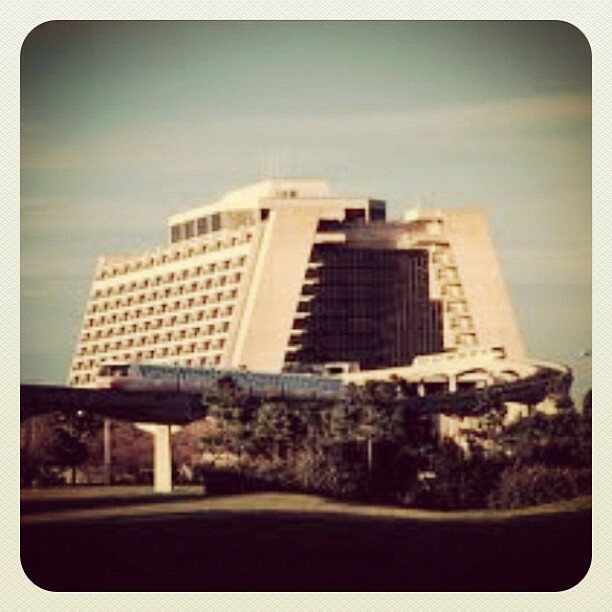 If the resort isn't going to be uber modern it should at least be retro modern. In trying to be both, it succeeds in neither one. In the spirit of 'credit where credit is due,' the bathrooms are absolutely wonderful. The sinks are really great. As far as common areas go this resort is super lacking. The pool was really blah and uninviting. I managed to go for a few dips while there...and there were NO OTHER GUESTS in the pool. One of the things I love most about AKL is the lively atmosphere of the resort/ pool...and that feeling is nowhere to be found at the Contemporary. No body was even hanging out at the pool bar! Come on folks...this is a vacation! Speaking of bars...The Outer Rim, the resorts lounge was also very uninviting. (and closes at 10:00!?!?!?) I really like to sit at the bar of whichever hotel we're staying at, chat with the bartender, and learn a little bit about the resort. 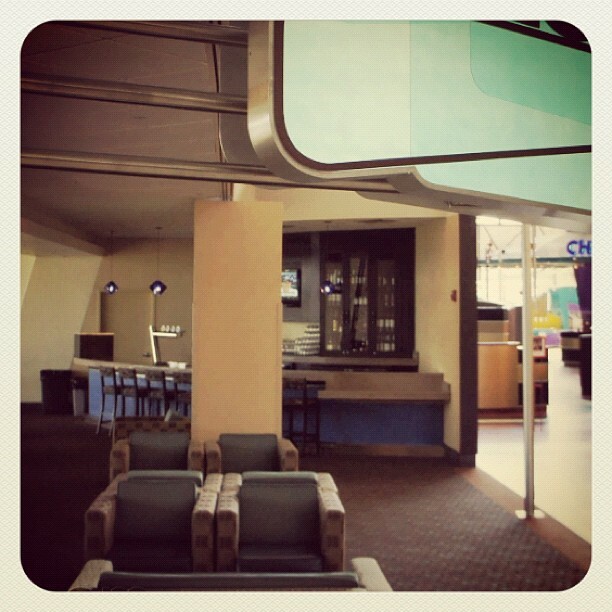 The way the lounge is set up, you might as well grab a beer from the Contempo Cafe and bring it over. No point in sitting at the bar. Outer Rim is no Victoria Falls. I understand that the most iconic image of this resort is the wide expanse of the grand canyon concourse. To me, the openness kills the atmosphere. I shouldn't be able to see into Chef Mickey's from Contempo Cafe...the should be secluded ala The Wave. The one redeeming factor of this is the wonderful sight of the monorail traveling through. Totally rad. I could probably keep ranting about things that I didn't like...but I'm sure my rambling isn't making much sense at this point. (You know I'm a huge fan of run on sentences.) But it comes down to this: To me, coziness equals Disney, and this resort lacks coziness. There will be another blog post either today or tomorrow going over the things we DID like at The Contemporary. *I'm from England. The only pools are overcrowded public pools. Thank you for your posting. I am a DIE HARD animal kingdom lodge fan. But after 2 stays, I cant help thinking I should try something else. I was looking at the Contemporary, but was worried about it being cold?